When you signed on to work at a large turnkey construction site as the lead supervisor, the days are long and time off is almost unthinkable. If you hadn’t convinced your company that you had to have your family relocated during this time, you probably wouldn’t see them for a year, at the very least. When your inventory supervisor comes and reports that some of the inventory seems to go missing, you start to fret. This is a common occurrence with most sites, where a small percentage of instruments and smaller pieces of equipment gets taken by some of the laborers you’ve hired. Most of this is because workers forget to empty their pockets before leaving. However, in this specific case, it seems like more inventory seems to have disappeared than the normal margin. Thinking it over, you come to realize that you need additional security buildings installed at the site, which although wasn’t in the proposed budget, after explaining it to management, they will be sure to give you a budget for this unexpected expenditure. 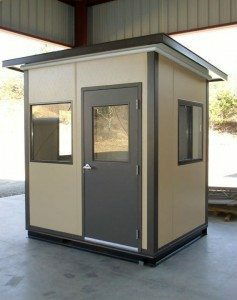 You know that management seems to change its mind like the weather, so when you started to look for your prefabricated guard houses, you come upon Panel Built Incorporated, a company that specializes in modular buildings also is a place to find the best guard booth available online. With a simple click, you download their order form and start the ordering process. With buildings being constructed in as little as two days, your site’s security can be increased in a minimal amount of time and with no effort from you. 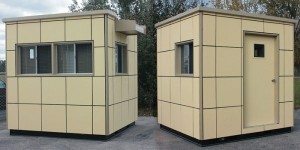 One service that makes Panel Built Incorporated stand out amongst our competitors is that you can order your prefabricated security guard houses on the Internet. Some of our buildings will take less than a week to ship out, with our shortest time being five days. After you get approval from your managers (if necessary), you could place your order, and then a working week later, a completed security booth will be shipped to your doorstep. It could be very likely that your anticipated space will not be ready for your new prefabricated guard house by the time you get the notification that your shack has been completed and on its way. In addition to this, we are extremely flexible when it comes to shipping: we can drop the building off to you at your warehouse or site; or if you would rather pick it up at our offices and transport the building on your own, we’d be more than happy to accommodate you. Our goal is to make sure you get the best business that you deserve. One of the common questions that our clients ask are “How do you get such detail from an online order?” There are two ways to get the information you need. The first is to download our quote form and fax it back to us. The second is to fill out the form in our free quote section. When you complete either of these two methods, one of our many experienced sales representatives will get back to you via email and assist you in finding exactly what you are looking for. Panel Built Incorporated’s Quick Ship Guard Shack is one of our most flexible guard booths available online for sale because we have a variety of guard houses in stock, where you could get a shack in five working days. Our other Quick Ship Guard Shacks vary in size with inside dimensions measuring 4’ x 4’ x 8’ to the large 6’ x 8’3 x 8’ security booth. Additional options would include slider or picture tempered glass windows, roof mounted or through the wall HVAC unit to ward off the elements, half glass or solid leaf metal door, as well as a sliding glass door, if that is what you want, a stainless steel counter, a surface mounted fluorescent light, duplex receptacles, switches, data box, and an Electrical Load Center. Depending on the type of industry you work in, we also offer blast-resistant ballistic rated guard houses. Each of these guard houses are fitted with a forklift or crane liftable base, which will make set up simple. In addition, our security booths are armored with 3/8” hardened plating composed of AR500 steel, welded on for increased support, making it capable of withstanding high powered rifle fire. Our windows won’t fail you either: They are made of non-spall materials, which is engineered to be as tough as its metal counterparts on the building. Our ballistic capabilities places our structures at an ANSI/UL Level 5 rating (Medium category), making it capable of withstanding a 7.62mm/.308 caliber rifle round at 10 meters. In addition, these security booths have been classified in the National Institute of Justice’s “Type III high-powered rifle” category. If you want to have a touch of class added to your prefabricated security guard houses, look no further than Panel Built Incorporated. If you want to have your security booth to match your building’s color schemes, we can help you with a custom structure using a rainbow of paint colors and finishes. Some of our clients have requested the use of decorative brick siding on our structures for a more at homey and established appearance. If you would like to add more windows, we will be more than happy to, this will make your security booth more welcoming by creating an open and airy environment. If you want your frame to mimic the antique or modern style of your office, mall, or hospital, we can do that as well.